You want to give your son the world, but the problem is, you’re not sure the world is the best place for him. Camp Mowglis founder Elizabeth Ford Holt asked herself the same question. She saw growth opportunities for boys slipping away as the pace and demands of daily life increased. Young men needed to get back to basics. To learn life’s important lessons. To feed their souls, nourish their minds, and strengthen their bodies. Mrs. Holt wanted to give boys a place to breathe. To build. And to belong. as it was over 100 years ago. Camp Mowglis is a three, four or seven week youth development experience. 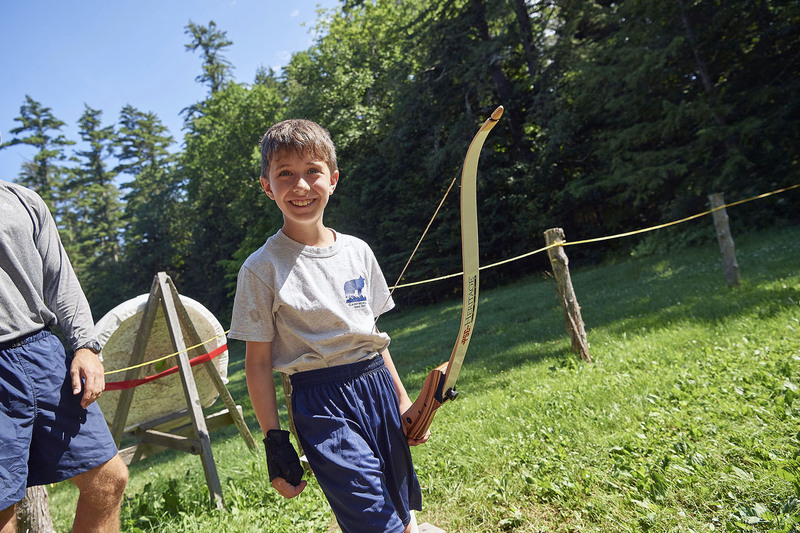 Every summer, we host a small group of around 100 boys in the natural beauty of the New Hampshire mountains and disconnect from everyday life in search of something bigger. Our “School of the Open” program is based on the timeless values of honesty, integrity, compassion, and respect for others (including Mother Earth). Pursuit of these values lays the foundations for everything we do. You’ll see it when your son stands tall in an unfamiliar place while making eye contact and shaking hands with strangers. You’ll see it when he asks to for a new hiking boots for his birthday instead of the latest smartphone. You’ll see it when he divvies up a group project and sets deadlines to keep team members on track. You’ll see it when he calls a friend who just lost a parent every day for a month, just to remind him he’s not alone in his hardship. You’ll see it when he shows up a half hour early to run extra laps before soccer practice. The mission of Camp Mowglis is to develop integrity, empathy, resilience, and leadership in young men through the time-tested and fun outdoor experiential program and community we call the “School of The Open”. At the core of the Mowglis mission is a commitment to create youth of sturdy character. The changes your son experiences here permeate through all areas of life. And while he’ll be thrilled to reunite after his seven weeks away, he’ll also have a new pack: the Mowglis family. Friendships from Camp Mowglis have deep roots and provide a support network to carry your son throughout his life. Your son will always have a home here. When you remove the 21st Century stress and strain, true magic has space to grow in the white space that remains. Camp Mowglis is the world you wish you could create for your son — one where values are instilled, meaningful friendships are created, and life can be simple again. We would love to welcome you to experience The Mowglis Way for yourself.